The kind of people that Tristan Pigott depicts are our real contemporaries. People who are attuned to the way that self-image is constantly chopped up, repackaged and beamed back at us through the wires and lenses of modern culture; the way that identity is always on ‘exhibition’, long before an artist gets involved. Combining unforgiving realism with an idiosyncratic candour, his work assumes an instantly engaging yet quietly unnerving atmosphere. 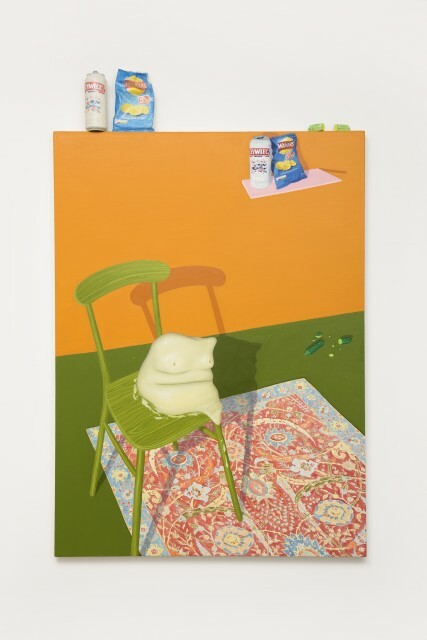 Pigott’s new show at the Cob Gallery, Juicy Bits, the artist experiments with the theme of ‘nature morte’ or, literally, ‘dead life’, through the form of imaginative multi-media work, combining painting with time-lapse lm and 3D printed sculpture. The installation of all this within a ‘living room’ setting develops on Pigott’s interest in cultivating a sense of the unusual within what seem like the most familiar environments, shifting the mundane into the arrestingly peculiar. With motifs often straying from one work to another, Pigott’s work has the blend of simplicity and complexity that often characterises a rich interior world externalised. In ‘SMS Me’ a cucumber watches other cucumbers re-enacting Velazquez’s ‘Rokeby Venus’ on an iPhone, while slices of cucumber rest on the oor like hunks of green esh. It’s a bizarre, oddly sexualised scene that seems to depict the individual willingly participating in the same culture that mutilates it. And yet those relentlessly upbeat smiley faces — the same ones that make the cucumbers human — combine with the high-vitamin colour scheme to suggest a blissful world of permanent smoothies and breakfast-time optimism, offsetting the work’s gloomier undercurrents. The advent of the trivialisation of information brought about by social media and other online sources is imperative to Pigott’s current practice. Works like the exhibition title piece, ‘Juicy Bits’, discuss the tendency for cultural online content to present audiences with count- less “best of” lists; not only over-simplifying paths for personal discovery, but also our subsequent experiences. The artist’s interest also lies in communicating the disposable nature of Western society in our pursuit of instant grati cation that has been accelerated further by recent technological developments. This is explored in ‘Fake Plastic Flowers’ where the main subject nervously picks her teeth and she contemplates whether or not she should take the easy road and purchase the mass-produced plastic owers online, as opposed to com- mitting her time and energy to the unique real thing. Pigott’s plan to produce one painting a day throughout the course of this new show provides a nal example of his highly developed fusion of playfulness and cynicism. Adapting Mikhail Bulgakov’s satirical 1925 novel Heart of A Dog to contemporary discussions about the ‘creative industries’, Pigott ironises the apparently contradictory demand placed on artists to be reliable producers of the unexpected. At the same time, the work adds a ‘live’ element that quenching our thirst for the artist to be present within the cosmos of his own work — a last, sideways comment on the interactions between identity, creativity and performance that form the centre of this diverse and distinctive exhibition. Tristan Pigott (b.1990) lives and works in London. Since graduating Camberwell College of Arts in 2012, he has exhibited in London at Cob Gallery (2015) and at Royal Academy Summer Exhibition (2015) and internationally in Nigeria, (2014) and Manhattan during Frieze Art Fair New York (2016). In 2015, Pigott was shortlisted for the BP Portrait Award.